With every invoice we send to our customers, we include a self-stamped, self-addressed Voice of Customer (VOC) postcard. 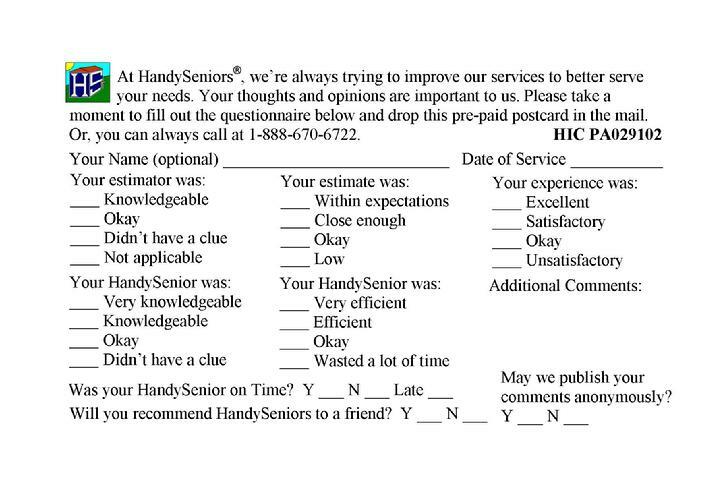 We ask each customer to rate us and let us know what they think about our services and our HandySeniors. They grade us and give us their comments. We'd love for you to see them all, but with over 1018 responses we only have space for a few. See what they have to say! "We've been married 56 years. This is the best and most efficient home repair we've ever had. Thank you." HandySeniors is the best handyman company ever!! "Evaluation choices don't allow for A+. I definitely want to give extra credit to both appointment maker and craftsman." "Very pleased-have recommended to others many times." "Excellent service will use again and recommend to others"
"Great Service for senior & others." "Handy Seniors did a great job and I was extremely pleased with the quality of the work. I would recommend using HandySeniors - no hassle, no worries - great value, great job." "Wonderful experience-definitely exceeded my expectations! Will definitely recommend to others & will be back again myself. " "My 3rd experience with HSr's & I recommend you to other women all the time. You guys are top notch!" "Little jobs you can't do? Or need some help PDQ? Let HandySeniors follow through." "I would have our technician back again in a heartbeat - money well spent!" "Knowledgeable, quick, tidy. Great work & great value!" "Awesome Job + Brian is Super! Chris too!" "Work was wonderful, thank you. :-)"
"Excellent work, very nice, would recommend to all!!" "Remarkable service and the highest quality of work. Highly personable & reliable! Would definitely use HSr's again & will"
"I was pleasantly surprised. I was expecting less from past experiences [other companies]. He was very good." "Tom...was the perfect choice for us. He was punctual, polite, friendly, knowledgeable, reliable, honest, eager to please & thorough." "Will use your services again! Thank You"
"Super Service! I've already recommended it to others! Charlie was great … thanks!" "Tom was above beyond efficient." "Fabulous, knowledgeable worker, excellent customer service and responsiveness"
"I got a reasonable estimate. The entire experience was great!, I will use HandySeniors again and I strongly recommend them"
"Dennis did a great job. We would recommend him & HandySeniors to anyone." "Great value for small jobs + good service"
"Fred did an exceptional job. 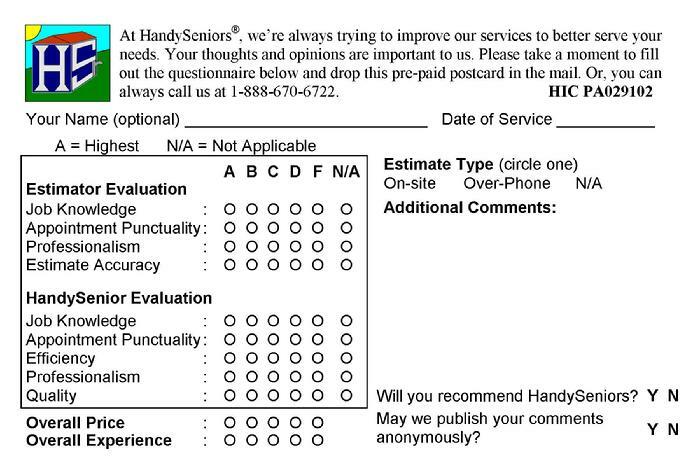 We were very pleased with HandySeniors!" "This was a great experience from start to finish - everyone was prompt, professional & efficient. All my "to do" list items were handled. Would definitely recommend & use them again, if needed"
“Tom is terrific, I'll be calling again." "Very pleased, looking forward to having HandySeniors help me with other tasks around the house." “Thanks for sending a professional, competent HandySenior. Fred was great! "I appreciate Brian's exceptional attention to the details of this project"
“Wonderful service & results, as always." "Charlie was like McGuyver … Thanks!" "As always, excellent. Have HandySeniors, so glad I found out about you." "This company is a wonderful resource for all those "small jobs that don't register with contractors. You get prompt estimates with clear explanations, and handymen who really know their business. " "Everything was done at the highest level"
"Very polite, and knowledgeable. Would recommend service and use again, Thank You"
"Great service-amazed at how fast Jack cleared our yard!" "Wonderful service & results, as always." From July, 2008, through December 2015, we visited 1024 different Customers, many of them multiple times. From January 2012 through December 2015 we visited 622 of our customers over 1264 times and frequently completed multiple jobs in each home. Add that to the previous years' 886 visits and it means that in the last seven and a half years we have visited our customers over 2150 times! As you can see, between the current Voice of Customer card and the old, our customers filled out VOC cards representing over 49 percent of the jobs we have completed. And it seems we have been doing an excellent job for the vast majority of our customers as the average grades for our HandySeniors' work has maintained a high "A" Rating for more than six years running. Still, we would love to be "4.0" so we keep trying to get better! We are always looking for ways to improve so if you have any suggestions, we would be glad to hear them and have them! Remember, it is your feedback that helps us to improve so keep it coming! In January, 2012, we changed our Voice Of Customer Card to more closely align with grading systems found on Internet Consumer Websites. We asked our customers to grade us from "A" to "F" because our education never stops. From January, 2012, through December, 2015, our customers filled out 584 rating cards after our HandySeniors completed jobs in over 1264 visits to our customers' homes. That is our customers letting us know in writing what they thought about the work done for over 46% of the jobs HandySeniors have done! See our "Report Card" below! From a historical perspective, from October 2008 through December 2011 we completed 886 Handyman jobs for our customers. So we have documented opinions on almost 49 percent of the work we did during that time as well. If you compare our grades from the old VOC cards to the new VOC cards I think you'll see that your feedback has definitely helped us to improve in a number of areas! We might have improved a little bit on these numbers over the past years, but we're sure we can get better still! Do you have an experience, suggestion, or comments you want to share with us? Please leave us a message in our Guest Book! HandySeniors® is a Registered Trademark for HandySeniors LLC.